During my sophomore year I took an SAT and ACT prep specific OHG grammar class taught by Ginny Bloxsom. 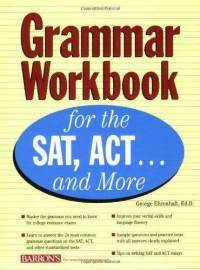 For this class we used the Grammar Workbook for the SAT, ACT… and More, by George Ehrenhaft. The course ran the whole year, and our class met once a month. For our assignments, we had to read sections of the workbook and answer the included practice questions. At home I also completed vocabulary quizzes and timed SAT/ACT english test sections that Ginny supplied us with after every class. While we were in class, we discussed questions that we didn’t understand or we found confusing. After everyone had their questions answered, we would play grammar and word games for the rest of class. From this class I learned how to answer unusual grammar questions and use proper grammar in my writing and speech. I grew up speaking fairly good grammar, so I usually can tell by ear when something is wrong, but now I know why. In addition, working with the book helped me understand common errors that students make on standardized tests and how to avoid making them.